Implantable cardiac monitors (ICMs) are becoming more commonly recommended during the investigation of a patient with transient loss of consciousness.1,2 The original first-generation devices were implanted by a surgical procedure, usually by a cardiologist in a cardiac catheterisation theatre on a day-case basis, lasting up to 30–45 minutes per procedure. This process is inherently resource heavy for theatre time, staff (implanting physician, catheter lab nurses, cardiac radiographer and cardiac physiologist), in addition to pre-admission assessment, surgical equipment and patient recovery in a day-case facility. The development of the next generation miniaturised Reveal LINQTM ICM3 device (Medtronic plc, Dublin, Ireland) provides the possibility of performing these procedures with a more simplified insertion kit over 20 minutes, as well as requiring less staff and with lower cost.1,4 We describe how we trained one of our cardiac physiologists (LC) to implant ICM devices autonomously in the screening room of our coronary care unit, and discuss the clinical benefits and cost savings of this service redesign. Surgical skills – suturing course (Royal College of Surgeons). Undertook Mental Capacity Act/informed consent course (online, Trust approved). Undertook training on use and administration of local anaesthetic mediated by a Trust pharmacist and an experienced implanter physician supervisor (PJK). It was necessary to amend the Trust’s medicines management policy to permit a clinical physiologist to administer medication, namely local anaesthetic. Clinical physiologists are classified as a voluntary registered healthcare professional and are not legally permitted to administer medications under patient group directions (PGDs) but are permitted to administer against a named patient prescription order. Thus, to allow a cardiac physiologist to administer local anaesthetic there are two options; adapt the request form into a prescription or use an independent prescriber to prescribe the medication prior to the procedure. Shadowed an experienced implanter (PJK) during three implant procedures – this allowed LC to become familiar with practical aspects of the procedure including how to explain the procedure to the patient, how to obtain fully informed consent, and how to undertake the necessary pre-procedural checks, as well as the actual implantation procedure. Performed 50 procedures with support from a cardiologist. A logbook was maintained for every procedure and formal feedback provided after each case. Surgical scrub training was led by a scrub nurse and recorded in LC’s logbook. Sign off authorising LC as independent implanter (September 2016). Her job description was amended to include LINQ™ implantation to ensure compliance with NHSLA (National Health Service Litigation Authority) requirements. Following this, LC has now also commenced implanting St. Jude Confirm devices (so far three cases). A standard operating procedure (SOP) (table 1). Educational videos – we made two educational videos in association with Health and Care Videos (http://videos.torbayandsouthdevon.nhs.uk/cardiology/17751).6 The first describes what will happen on the day of the procedure from a patient’s point of view including what they need to do in preparation, as well as information about the implantation itself. The second describes the use of the “MyCarelink™” remote communicator and how this should be set up at home and used for on-demand recordings. Both were made available via our trust website and on a tablet device for those patients who did not have internet access. A dedicated LINQ™ implant list (monthly). From November 2015 all patients referred for LINQ insertion were booked into a monthly implantation (first list 10 December 2015). Patients were allocated 20-minute slots with a maximum of eight patients per list. Patients were asked to attend the waiting area fully dressed but wearing buttoned shirts/blouses, which could easily be undone. Warfarin and direct oral anticoagulants (DOACs) were not suspended, but those patients on warfarin required near-patient testing (NPT) international normalised ratio (INR) tests prior to implant (see SOP, table 1). Anxious patients were able to have their spouse/relative/friend accompany them during the procedure. After device implantation we initially undertook individual training on the use of the home monitor, but this quickly developed into group sessions of three to four patients together with their attending spouses/relatives/friends. LC has now performed 116 ICM implant procedures (113 LINQ™ and three St. Jude Confirm™ devices). Two patients developed minor bleeding, which required the use of a hand-held diathermy (both were on anticoagulants). Two patients required skin sutures to adequately close the wound. No patient developed early or late infection or erosion of the device. Eight of these patients had permanent pacemakers (PPMs) already in situ with no complications from ICM insertion. The only significant complication was a small apical pneumothorax related to deep anaesthetic infiltration in a patient with very low body mass index (BMI, 18 kg/m2). This patient was monitored overnight and discharged the next day. Patient feedback was obtained from the first 25 patients and has been highly supportive of the new service and was without any significant criticism. 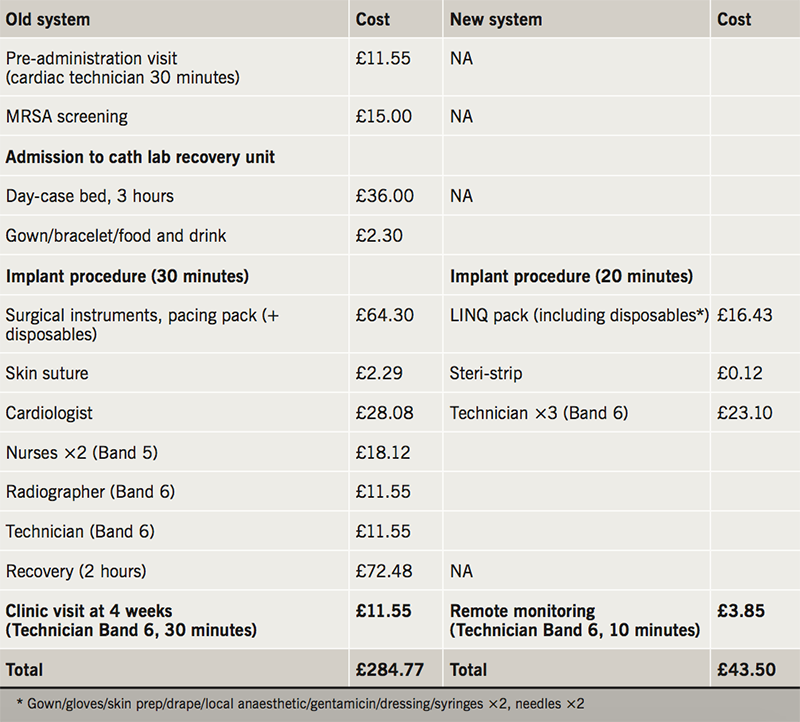 Table 2 details the healthcare costs of the old and new ICM implantation systems at our centre. This demonstrates a net saving amount of £241.27 per implant procedure using the new system. The use of ICMs is set to markedly increase, with their use earlier in the investigative algorithm for syncope and with our ageing population. There is, thus, a pressing need to perform these procedures efficiently and cost-effectively. Device miniaturisation provides an opportunity to redesign the traditional service of a cardiologist implanting the device in a cardiac catheterisation theatre. In this report, we have shown ICM devices can be safely and routinely implanted in a non-theatre environment.3 This is currently under study in the US in the Reveal In-Office 2 (RIO 2) study (NCT 02395536).8 A recent health-economic analysis in three European countries hypothesised savings of 600–800 Euros per case by moving the procedure out of a cardiac catheter laboratory.7 Our experience, in the real world, confirms a cost saving of £241.27 per case. In addition to the financial savings of this service redesign, there are clearly additional benefits in moving these procedures out of the cardiac catheterisation theatre, thereby freeing up staff and facilities for other activity. In the next 12 months we anticipate performing 100 ICM device implants in our screening room, thereby enabling 17 additional 30-minute sessions of activity in the vacated cardiac catheterisation theatre. Removing this unnecessary activity from a cardiac catheterisation theatre is clearly particularly important for centres that operate using a single theatre and provide emergency procedures, such as coronary angioplasty. However, the more innovative aspect of our new service is that we have trained a non-physician to perform these procedures. Procedural activity has traditionally been the province of a medically qualified individual, and achieving this for a non-physician required considerable time and effort on behalf of the trainee (LC) in undertaking the relevant training courses. The service redesign was greatly facilitated by the development of a clear and concise SOP document. In addition, we found that the development and use of the patient information videos markedly improved patient understanding and improved the consent process, allowing us to cancel any pre-admission review. We aim to further develop non-physician implantation by adding use of skin sutures and hand-held diathermy into the training regimen and have already started to train a second operator (MG), who has so far implanted four LINQ™ devices. We believe redesigning ICM implantations to be undertaken by a non-physician in a non-theatre environment should become routine practice. This change in practice is becoming increasingly prominent,9,10 however, we have shown that a formal service redesign is possible and has led to better patient experience and satisfaction, generated more cardiac catheterisation theatre availability, as well as physician time availability, at a reduced overall cost. Medtronic helped fund the video production. The article is focused on a service redesign for already provided procedures for patients, focused on a change in practice rather than new techniques or major research requiring human subjects, therefore, no ethics committee approval was requested as it was not required.